'Carpathia' (Robert Schreiner). MDB, height 4" (10 cm). Early bloom. Standards full yellow; falls yellow-brown, edged lighter yellow. A Transylvanian (Rumanian) form of I. pumila from collected seed. Schreiner.--Source of this description unknown? 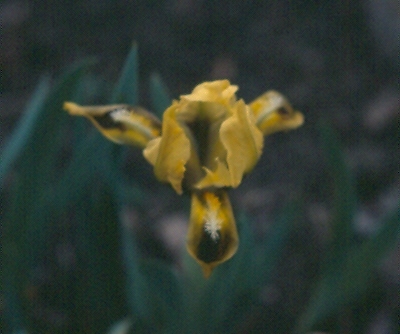 (Schreiner, R. 1942) MDB, 3" (8 cm), EM Standards clear light yellow, crinkled; falls olive yellow, edged light yellow. Beard deepest orange in throat, end clear cream. Parentage unknown. I. pumila seed from Cluj Botanic Garden, Romania. Retroactively registered by AIS 2017. Schreiner 1942. Somehow The registration and the Iris being offered by the originators do not match. The 'Carpathia' in cultivation has always been a yellow bitone without the brown falls. Check out references. Picture may be over concentrated in color. ‘Carpathia’. (Robert Schreiner, Transylvania). MDB; 4” (10 cm), E. Selected by Robert Schreiner from seed sent by the University of Cluj, Cluj, Romania, which had been originally collected in Transylvania near the mouth of the Danube River. “A real midget, only 4” high. Standards clear light yellow, crinkled. Falls olive yellow, edged light yellow. Beard particularly interesting and unusual: outer part tall, clear cream; inner part deepest orange. Exceedingly floriferous.”--Rainbow Gardens 1951. 2n=32. Iris pumila L..